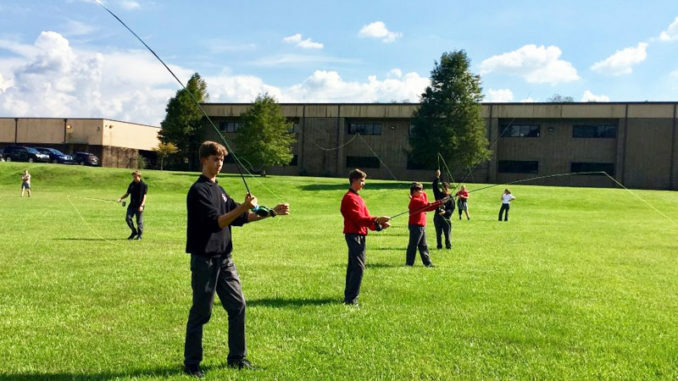 Some members of the St. Michael Fly Fishing Club practice casting on school grounds at one of their after-school meetings. Only half the members can practice at one time due to shortage of equipment. In the forty-five years since I graduated from high school, a whole lot has changed with regards to extracurricular activities. Back in my day, we had football, basketball, volleyball, track, Beta (honor) society, 4-H club, and Future Farmers of America (FFA). That was it! By contrast, today my alma mater has fourteen varsity sports and over a dozen clubs. One of those clubs is bass fishing. In fact, most schools in Louisiana have a bass fishing club that competes against other schools. In southeast Louisiana, where saltwater fishing is king, several high schools – such as Chalmette, Rummel, and Brother Martin – have more general fishing clubs. Nationwide, there are even a couple of dozen high school fly fishing clubs. They tend to be concentrated in regions where fly fishing is more prominent, such as Pennsylvania, Colorado and Montana. Now there’s one in Louisiana. Frequent readers of this column are very familiar with Kevin “MusicDoc” Andry. The award-winning band director at St. Micheal High School in Baton Rouge is a nationally-renowned fly tier and kayak angler. His deer hair flies are works of art, and his kayak fishing adventures are followed by thousands of online readers. It’s those adventures that led to the formation of St. Michael High School Fly Fishing Club. According to Kevin, several students who were fans of his blog came forward with the idea. With any new club, he had to draw up a proposal and get it approved by the school administration. He also had to come up with a liability waiver. 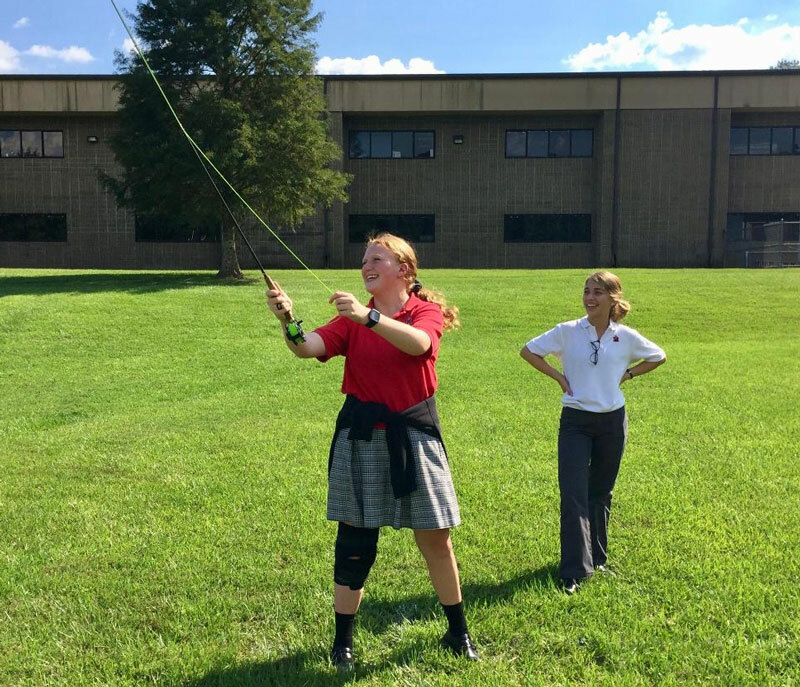 Allison Kimbrough, a member of the St. Michael’s Fly Fishing Club, practices casting under the watchful eye of clubmate Anna Crifasi. At the school’s annual Club Day, he put up a table, a poster and had 22 students sign up! As with most clubs, there was a little attrition, but the interest school-wide is growing. As Andry describes it, once he was approached, it was a no-brainer. The SMFF Club meets twice a month, after school on Wednesdays, so it doesn’t conflict with after-school band rehearsals or most varsity sports. Each meeting focuses on some fly fishing skill. There are casting instructions, tying lessons, knot-tying instructions, an overview of rigging and setups, and more. Tying flies is a big part of the club. The students love showing their “homework” to their fellow classmates. On occasion, there’s even a walk to a nearby neighborhood lake to do some fishing. Several students have caught their first fish ever on these outings. 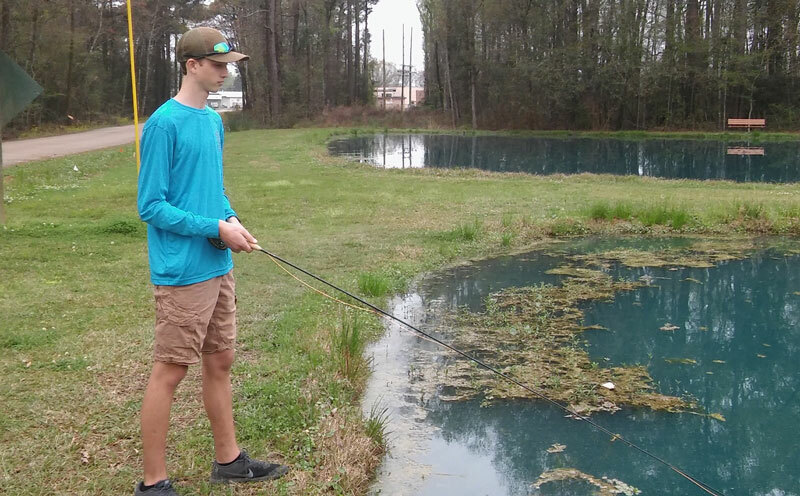 Alex Rodrigue, a freshman at St. Micheal High School and member of the school’s fly fishing club, fishes the LDWF Waddill Refuge ponds for bass. Andry has even bigger plans for the club. He’s excited about their first annual St. Michael Fish Pics Tournament, similar to some of the year-round CPR tournaments that organizations like Bayou Coast Kayak Fishing Club have. The species list includes bass, bream, crappie, catfish and “other” (gar, carp, choupique, etc). 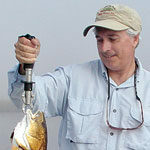 The idea is to get club members out fishing and have some fun catching different species. While each club member may have had different reasons for joining, most shared the expectation of learning a lifelong skill that melded with their love of the outdoors. Tanner Pike is a sophomore at St. Michael. He explained what the club has done for him. 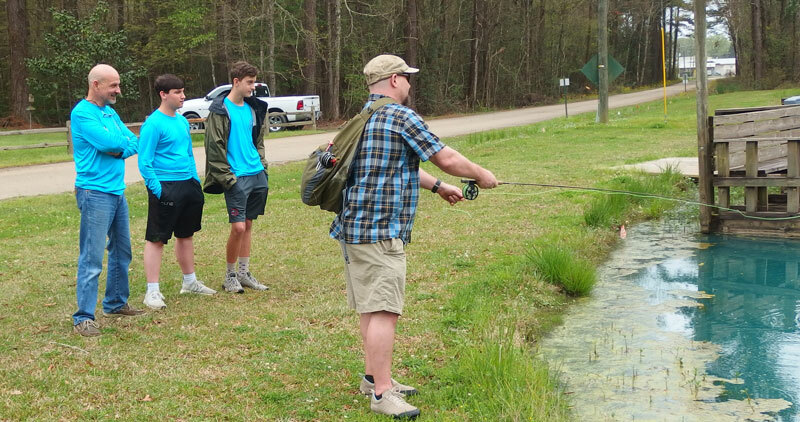 From left, Kevin Andry and St. Micheal Fly Fishing Club members Brayden Burleigh and Tanner Pike watch on as Red Stick Fly Fishers Education Director Sydney Dobson gives a casting lesson. Fellow sophomore Brayden Burleigh agrees with Pike about fly tying. Andry is the sole club sponsor and instructor, so with a club this size he does need some help. Some members of the local fly club, the Red Stick Fly Fishers, have offered. However, any outside help requires dealing with liability issues. Then there’s the equipment issue. Most of the students have had to provide their own. Fortunately, many asked Santa for rod and reel outfits for Christmas and got their wish. Still, several students have to share rods. Andry is hoping to get club sponsorship to help procure needed equipment and fly tying tools and materials. Anna Crifasi casts her fly line in hopes of hooking up on her first fish on fly rod. 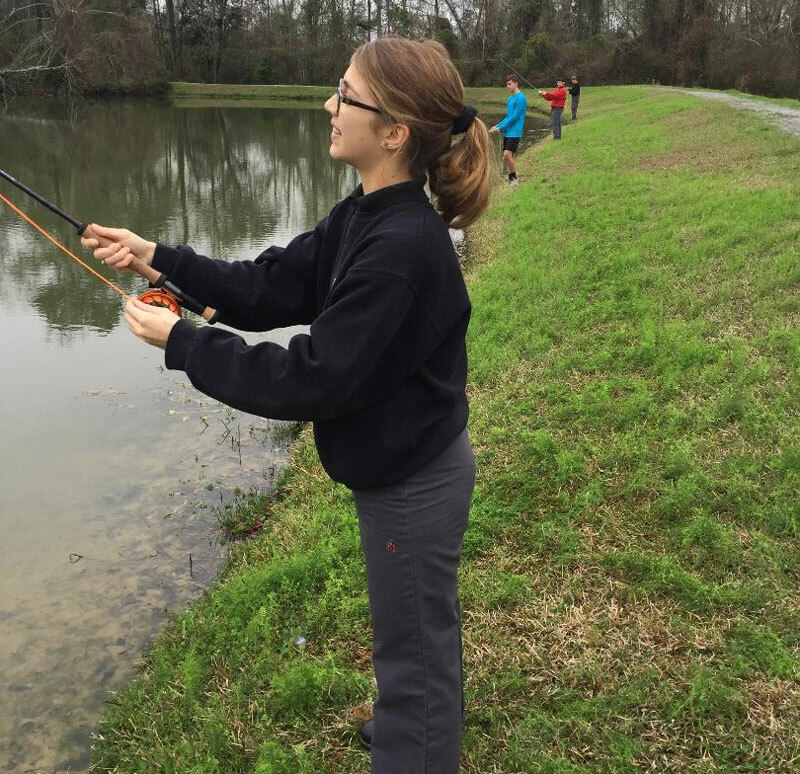 A senior at St. Michael, Anna is excited about being on the school’s new fly fishing club. Perhaps the biggest challenge is perception. Fly anglers will have a difficult time this month. Not catching fish, but deciding where and what to catch. For example, with the delayed winter we’ve had, expect lots of bass to bed during the full moon. Woolybuggers, Bass Bullies, Dragon Tails, and streamers slowly worked over beds will draw strikes. Bream will also be active. Jitterbees, Cap Spiders, Slow Sinking Spiders are guaranteed to put a bend in your fly rod. A Rosborough Hares Ears suspended 2 to 3 feet under a small strike indicator is also dynamite. In the marsh, the grass flats are filling up with small crabs and shrimp. The Spottail Elvis will be cruising these beds looking for an easy meal. A wide variety of crab, shrimp and baitfish patterns will work. If heavy grass is an issue, try a bendback-style fly. Later this month, big speckled trout will be in the surf. Don your waders and toss out Crease Flies or Skipping Bugs. Big baitfish patterns like Whitlock’s Baitfish and Deceivers are good also. Apr. 6 (Sat) – New Orleans Fly Fishing Expo, Deutsches Haus, 1700 Moss St., New Orleans. 8 a.m. to 4 p.m. Free admission. Special guest: Jon Cave. Seminars, fly tying, casting instruction, exhibitors and more. Iron Fly competition. Free kayak demos courtesy of Masseys Outfitters. Proceeds benefit Casting For Recovery. Website www.neworleansflyfishers.com. Apr. 6 (Sat) – 2019 International Fly Fishing Film Festival, Orvis, 7601 Bluebonnet Blvd, Baton Rouge. 6 p.m. to 8:30 p.m. Tickets: $15 available at store. Several short films celebrating the sport. Tickets limited, so advance purchase recommended. For more info, call 225-757-7286. Apr. 27 (Sat) – 3rd annual Fly Fishin For The Mission Tournament, PAC Kayak Rentals, Pointe-aux-Chenes. Fish from boat or kayak. Two person teams (2 kayakers per team). Entry fee: $50 per team. Activities include casting clinics, kayak demos, heroes fishing. Benefits Mission Six charity. Website: www.trollsquadfishing.com.